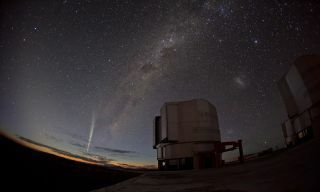 European Southern Observatory optician Guillaume Blanchard captured this marvellous wide-angle photo of Comet Lovejoy on 22 December 2011 as it appeared over Paranal Observatory in Chile. Comet C/2011 W3 Lovejoy is a comet on its way to the outer solar system. It survived a close brush with the sun in December 2011. The comet flew close enough to the star to be within its atmosphere, which many astronomers thought would destroy it forever. "It's absolutely astounding," stated Karl Battams of the Naval Research Lab in December 2011, shortly after the event occurred. "I did not think the comet's icy core was big enough to survive plunging through the several million degree solar corona for close to an hour, but Comet Lovejoy is still with us." The comet was first spotted by amateur astronomer Terry Lovejoy in November 2011, from his back yard in Australia. His find — which is unusual in an era where automated telescopes make most comet discoveries — revealed a comet on a suicide course toward the sun. The comet skimmed its surface by only 75,000 miles (120,000 kilometers), but survived. While the comet's peak brightness in the Southern Hemisphere was not as bright as some comets, NASA still said the view was "amazing." The agency said that viewers in places such as South Africa and New Zealand described it as a searchlight. Further, NASA astronaut Dan Burbank, then on the International Space Station, classified the comet as one of the neatest things he'd ever seen from space. Beyond the amateur observations, professionals were using a fleet of spacecraft and telescopes to watch the comet head toward the sun and escape death. This included the Solar and Heliospheric Observatory (SOHO), the Solar Dynamics Observatory (SDO), the Solar TErrestrial RElations Observatory (STEREO), Japan's Hinode spacecraft and Europe's Proba2 microsatellite, NASA said in 2011. Astronomers were interested in finding out about why the comet's tail moved while it was in the solar corona, as well as the big question of why the comet survived in the first place. The comet will be back in about 600 years. Lovejoy is a prolific comet discoverer who so far has four comets to his name. A more recent find besides Comet C/2011 W3 Lovejoy was Comet C/2013 R1 Lovejoy, which made its closest approach to the sun on Dec. 22, 2013, and is streaking toward the outer solar system. His other comet discoveries were C/2007 E2 Lovejoy and C/2007 K5 Lovejoy, which were both found in 2007. Lovejoy's love of comet hunting began in his childhood in part due to several family accounts of viewing famous comets. His grandmother saw Halley's Comet in 1910 and his father saw Comet Ikeya-Seki in 1965, Lovejoy recalled in a profile on website Ice in Space. While he did some searching in the 1980s and 1990s, he really became serious about it around 2004, when he made a setup that takes 10 to 16 images of a field of view. He then stacks them to use the "blinking" method to view comets. A closer object in space will move faster than the background stars, which makes this a common method to look at comets and other nearby celestial objects. "I guess the attraction is that comets show a great variety of detail and phenomena. There is also a thrill of seeing a bright comet develop from a faint diffuse blur into a intensely brilliant object with a searchlight beam tail," Lovejoy said in the profile. He added that he does have an advantage over the more professional observatories. "Most of the big surveys don’t search too close to the sun where most comets are brightest. Furthermore, coverage is not always complete by the big surveys; they can’t look everywhere at once (at least not yet)," he said.